Available for pre-order for £399, the Vuze XR Camera makes extraordinary content creation possible in 360° and VR180 with easy and fun effects, quick sharing to social media, and live streaming with a mobile phone. (NEW YORK CITY & COLOGNE – Sept. 25, 2018) Building on its aim to make 360 degree and VR photo and video content creation accessible to all, HumanEyes Technologies announced today at Photokina the full product details for its Vuze XR Camera, which is now available for pre-order at VuzeXR.com for £399. For a limited time, pre-order customers will receive a free bundle that includes a 360° underwater case, a micro SD card, and free worldwide shipping. Offer is valid until November 4th. Shipping in late November, the Vuze XR Camera enables consumers and prosumers to create and share exciting experiences in both 5.7K 360° (2D) or VR180 (3D) formats. The camera includes a mobile app, for iOS and Android, and desktop editing software, for Mac and Windows. Customers can create immersive experiences, popular 360° panoramas like Tiny Planet, adding stickers, and can share it now with live streaming or later on social media. Vuze XR customers can make their content even more interactive by creating their own VR website with the HumanEyes Zone. “People want to bring their content to life and they want to share their experiences for others to enjoy. We created a dual 360° and VR180 camera, along with a companion mobile app, giving them the ability to capture high quality immersive experiences that can be shared in the moment. The Vuze XR makes it easy and fun to share all the moments from every angle,” said Shahar Bin-Nun, CEO of HumanEyes Technologies. Available in black or white, the unique dual-camera design of the Vuze XR Camera seamlessly combines two advanced capture systems into one pocketable device. Portable and simple-to-use, the camera gives everyone the power and convenience to record and live stream, or share, from their mobile phone or computer. “Click” between 2D 360° mode (when the camera is closed) and 3D VR180 mode (when the camera is open). Mobile app stabilization and editing features include: 360° panoramas, effects, filters, stickers, ‘Directors Cut’ mode. Live streaming: Stream live to popular social media channels, including Facebook and YouTube in 360° and VR180. The Vuze XR Mobile App: For iOS and Android, which provides remote camera control over Wi-Fi, photo and video preview, editing, and the ability to upload to social media, as well live streaming. Additionally, the app features stabilization control, photo and video filters, virtual stickers, the ability to add text, color adjustments and the “Directors Cut” mode with Track and Follow object viewpoint adjustment, Little Planet like effects, fly in/out effects and more. Accessories: Tripod and underwater cases for 360° and VR180. 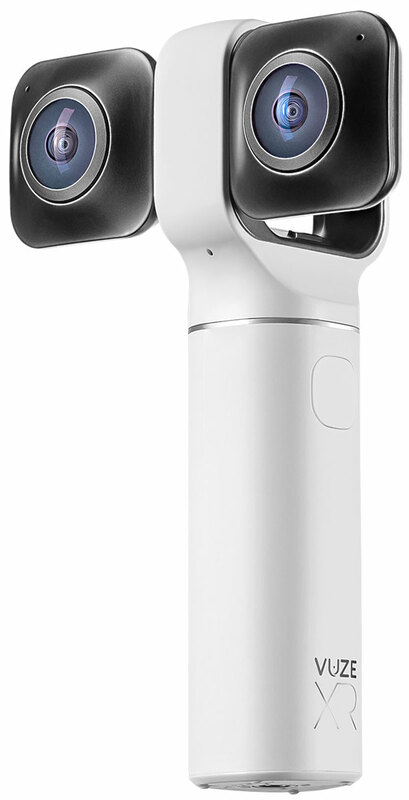 The HumanEyes Vuze XR Camera is the latest innovation from the company’s award-winning 360° and VR camera line, which includes the Vuze and Vuze+ VR cameras. To see the Vuze XR Camera in action, view more product specifications and pre-order, visit VuzeXR.com. For hi-res images, please see here. To see the XR in person, please visit the booth at Photokina. JK Imaging Ltd., the worldwide licensee for KODAK PIXPRO Digital Cameras and Devices, today announced a preliminary preview of the next generation KODAK PIXPRO 360 4K VR Camera, a compact, single-body design to target the rapidly growing 360° VR video consumer market.